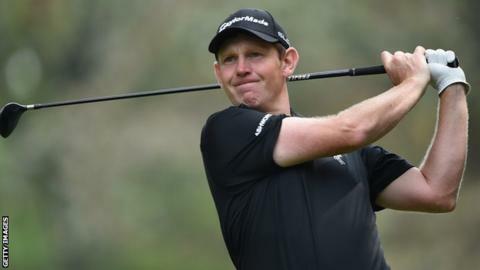 Stephen Gallacher narrowly missed out on automatic qualification for Europe's Ryder Cup team despite a superb final round at the Italian Open. The Scot shot a seven-under 65 to jump from sixth to third in Turin. Gallacher needed a top-two finish to overhaul Graeme McDowell, who instead claims the final automatic place on the team. But the Scot could still make his first Ryder Cup appearance if he gets one of Paul McGinley's three captain's picks. "It was a tall order, but I'm proud of the way I played," said Gallacher. "You can't get any closer than that. "It comes down to somebody else's opinion [now]. There are four or five guys who are worthy of it, so it just comes down to what Paul sees." South Africa's Hennie Otto won the tournament, finishing 20 under, with England's David Howell two shots back in second. Gallacher went out in 30 as he sunk six birdies in a blistering front nine, but he failed to match that form on the back nine as he came home in 35. That allowed Howell, who began the day tied seventh, to overtake him with a magnificent round of 63. McGinley announces his three captain's picks on Tuesday and the Irishman said Gallacher's excellent result would be taken into consideration. "It was a terrific performance by Stevie - all credit to him," McGinley said. "He really tore the front nine apart. "His performance this week will be very strongly in his favour when it comes to making the picks, but he's not guaranteed a pick. "There are other golfers to be looked at in the cold light of day." The English trio of Ian Poulter, Lee Westwood and Luke Donald and Italy's Francesco Molinari are among the other names thought to be in contention for the final three places on the European team.